Picking up where I left off yesterday, today I have the cool hues from the OPI Brazil collection that I got for review. Left to right: Next Stop The Bikini Zone, Don't Bossa Nova Me Around, Taupe-less Beach, I Sao Paolo Over There, Amazon Amazoff, and OPI Scores a Goal. Of course the most interesting of these to me was the purpley shimmer, Next Stop the Bikini Zone. 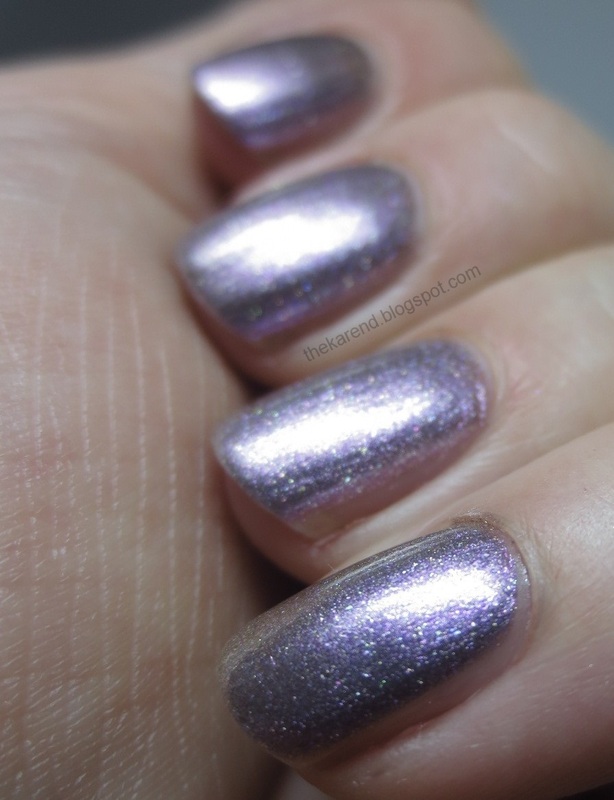 In the bottle, this displays a lilac to warm greige duochrome shift with pops of sparkle. 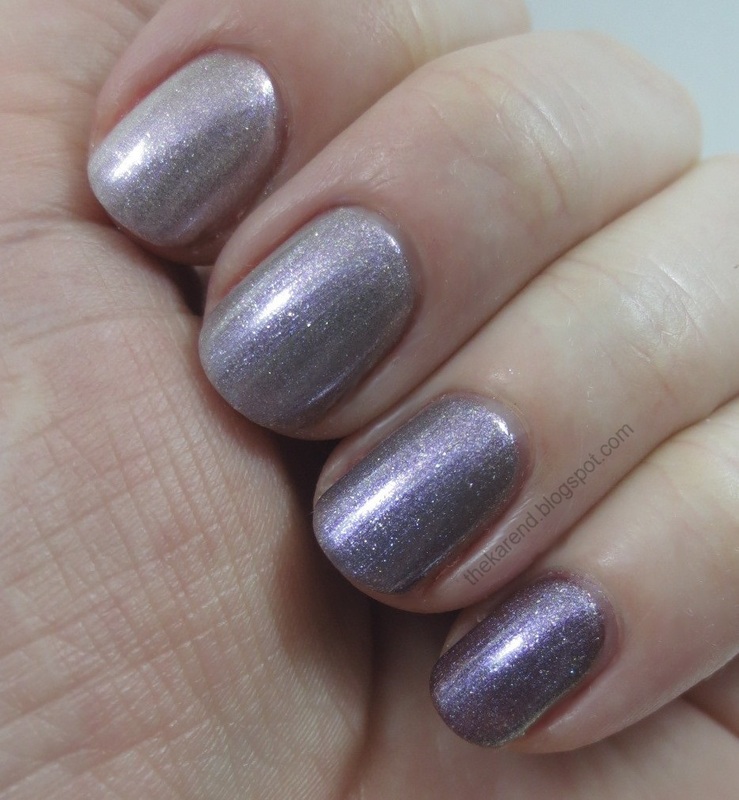 I was so entranced by how it looked on my nails at three coats that I didn't notice my bottle shots were all a little wonky; I can hold a bottle more elegantly than this and focus my camera better, but I was all "ooh, pretty polish" and got distracted.. The color shift is subtle, since the two hues are quite similar, but it's definitely visible in normal light with no dark base color needed to get it to appear. In the photo below, you can see how it looks at different angles, more silvery greige on my index finger at the top, ranging to more purple on my pinky on the bottom. And the little sparkles add another element of interest, too. Move in close and you can see microflakies in the shimmer. In low light, Next Stop The Bikini Zone takes on an almost foil/metallic finish. I definitely did not get bored looking at this (if you couldn't tell from the way we're a half dozen photos into this post and I'm still going on about this first color). Eventually I had to move on to the other colors in this half of the collection. 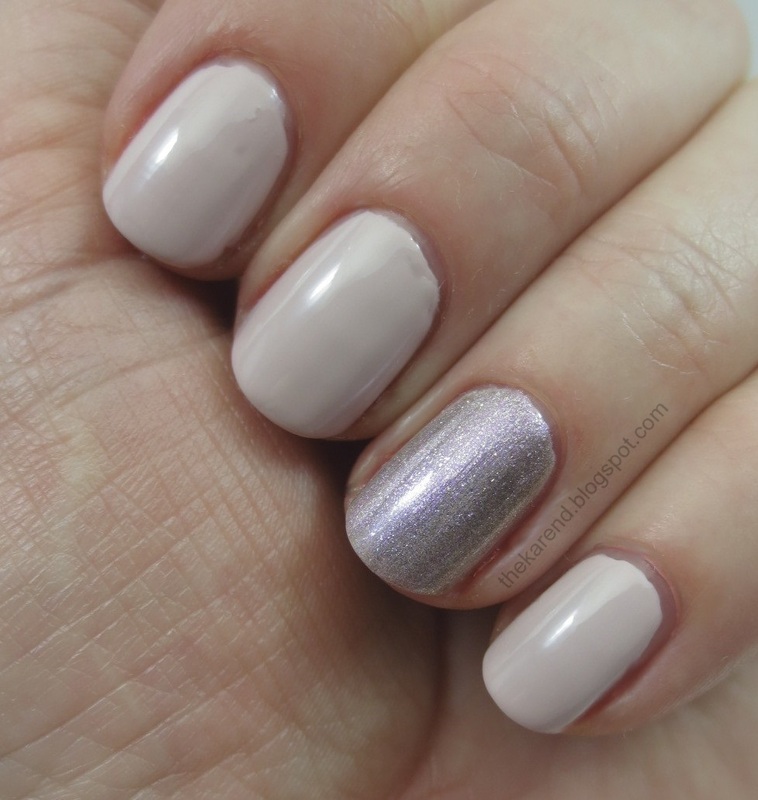 Don't Bossa Nova Me Around is a warm light pinky taupe creme. It's very well behaved for a pale creme; two coats was ample for my swatch. And yes, I couldn't resist the lure of Bikini Zone and added one coat of it on top of Bossa Nova for an accent nail. The light base really seemed to bring out Bikini Zone's silvery side. Bossa Nova reminded me of something, so I went digging in my stash and came out with Orly Decades of Dysfunction (from 2012's Dark Shadows collection, though the color was also previously released as Pure Porcelain as proved by The PolishAholic). As it turned out, the Orly was slightly less pink than the OPI. Top to bottom below: OPI, Orly, OPI, Orly. At this point, I didn't have it in me to swatch three more cremes on their own, so I did a not-quite-ombre with (top to bottom) Don't Bossa Nova Me Around, Taupe-less, I Sao Paolo Over There, and OPI Scores a Goal. All were two coats. Taupe-less and I Sao Paolo Over There are both greyed taupes, with Taupe-less being lighter. 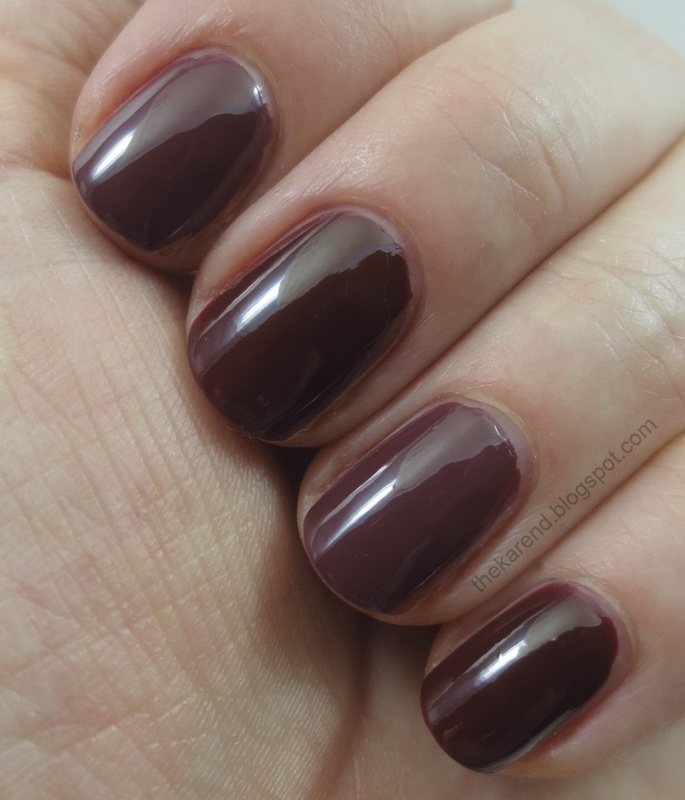 OPI Scores a Goal is a dark brown-ish purple (or maybe purple-ish brown with a little red wine mixed in). It will probably come as no surprise that the next thing I did was put a coat of Bikini Zone over the not-quite-ombre (which actually made it more ombre-like since the base colors were muted by the duochrome). The hard part of doing comparisons of the taupes was narrowing down the options, since I have so many cremes in that color family. Left to right below: L'Oreal Eiffel for You, OPI Taupe-less, Nails Inc Porchester Square. This looks like the start of the most subtle light taupe ombre ever, as the OPI is just a touch lighter than the L'Oreal and a touch darker than the Nails Inc.
Left to right below: China Glaze Channelesque, OPI I Sao Paolo Over There, Sally Hansen Commander in Chic. 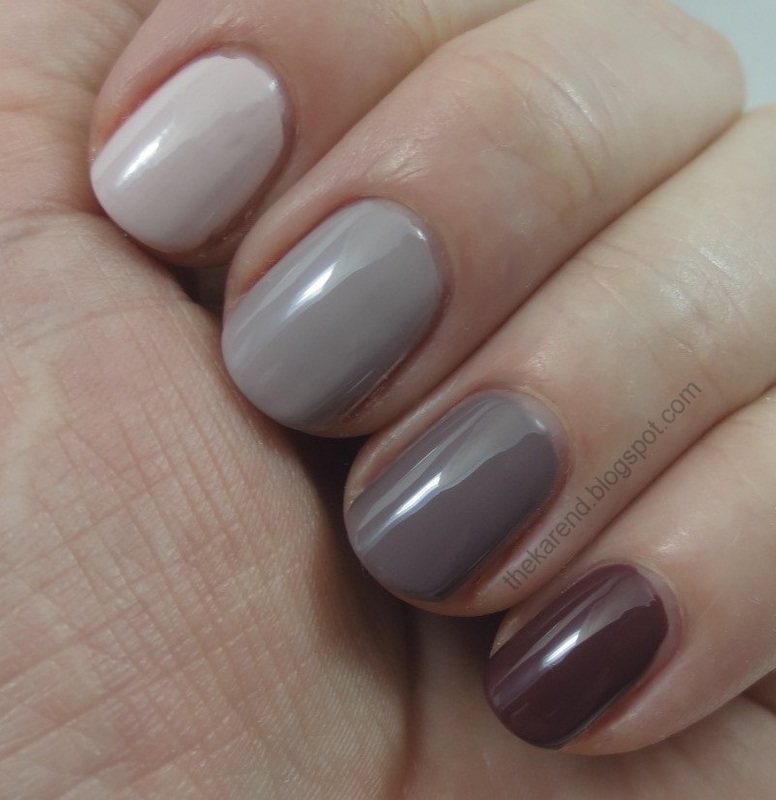 If forced to find differences between these, I suppose I could say the China Glaze is a bit more purple and the Sally Hansen a bit more brown than the OPI, but even greyish purpley taupe lover that I am, I could be happy with owning only one of these. I thought I'd have an easy time finding a match for OPI Scores a Goal, but it was more purple than my dark browns and more brown than my dark purples. I ended up grabbing OPI Oh To Be 25 Again and found that when both were applied thickly, they were a pretty good match (probably because all vampies start to look alike to me as they approach black)—see my top two nails below, Scores is first, then 25 Again—but when applied more lightly, Scores definitely looked more brownish purple to 25 Again's red—see bottom two nails, Scores is first, then 25 Again. I was so far into comparison mode at this point that I neglected to swatch Amazon Amazoff and just proceeded directly to comps. Left to right: Nails Inc. Portland Place, OPI Amazon Amazoff, OPI Jade is the New Black. Portland Place is darker and a touch less blue than AmazON. Jade is the New Black is entirely too green to be a match, but I wanted to see how this new OPI green compared to the one that was all the rage when I got back into nails a few years back. Another difference among these that doesn't show in the photo and didn't really show that well to the naked eye either is that AmazON has a very very subtle shimmer to it. Amazon Amazoff did get a lead role in the dotticure I did to wrap up my play session with this group of polishes. I alternated Amazon Amazoff and OPI Scores a Goal, then added dots with Don't Bossa Nova Me Around and the color not used for the base of each nail before covering it all with topcoat. As usual, I could have been neater with my dotting, but I still think it's a fun look. I think it's obvious that my pick from this half of the collection is Next Stop The Bikini Zone. Amazon Amazoff deserves a mention, too, even though I gave it short shrift in my swatching. What catches your eye? The shimmer one is definitely my favorite.